Two-time finalist Matthew Stevens set up a World Championship second-round meeting with Ronnie O'Sullivan by comfortably beating Mark Williams. Stevens, 37, led his Welsh compatriot 7-2 overnight and a break of 115 in the first frame after the resumption set the tone as he secured a 10-2 win. At 8-2, Williams called a foul on himself to let the world number 35 in and he closed out the match. Elsewhere, Joe Perry reached round two with a 10-4 win over Zhang Anda. The Chinese player won three frames at the start of the second session to trail 8-4 but could not narrow the gap further. Perry could face Shaun Murphy next - the 2005 champion leads Finland's Robin Hull 7-2. Zhang Anda compiled a 132 break in defeat by Joe Perry, the fourth-highest in the tournament so far. There have been 21 centuries at the Crucible, Neil Robertson's 143 is still the highest break. Wednesday was a day of emphatic scorelines at the Crucible with Ronnie O'Sullivan beating Craig Steadman 10-3 and Judd Trump taking a commanding 7-2 lead over another qualifier, Stuart Carrington. 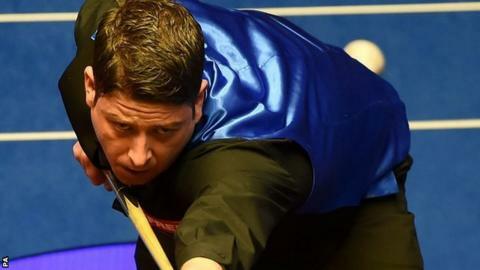 Stevens was not in action long on day five in Sheffield as he stretched his advantage quickly, though Williams did briefly threaten a 147 in the final frame, potting seven reds and blacks. "Matthew is playing as well as anyone in this championship," said BBC commentator Dennis Taylor as Stevens finished with a 73, his sixth half-century break in 12 frames. Stevens cited a new found happiness in his personal life as a reason for the his new-found form, having arrived in Sheffield without a ranking event title since the UK Championship in 2003. But he consistently took his chances and after Williams' self-declared foul for striking the white twice, brilliantly screwed off two cushions when potting a blue to develop a telling scoring opportunity. He is likely to need further improvement when he takes on O'Sullivan - who is seeking a sixth world title and comfortably has the better of the head-to-head record with the Welshman.